Throughout Virginia, nearly 400,000 children under the age of 6 have working parents. In order for parents to work, many depend on child care. Yet, in too many communities, child care is difficult to find, more difficult to afford, and too often of questionable quality. With the Virginia Education and Action Center, you can learn more about the issues involved with promoting the health and safety of children in child care and how you can work with us to promote quality child care settings for children throughout Virginia. Take Action and join us today. Policymakers need to hear that parents need child care and children should be safe in child care settings. Parent stories concerning their experiences with child care can often have a huge impact with regard to policy decisions. For example, your stories can help policymakers understand that they need to work to make child care safer for Virginia’s children. Your voice makes a difference in the safety, quality and affordability of child care. 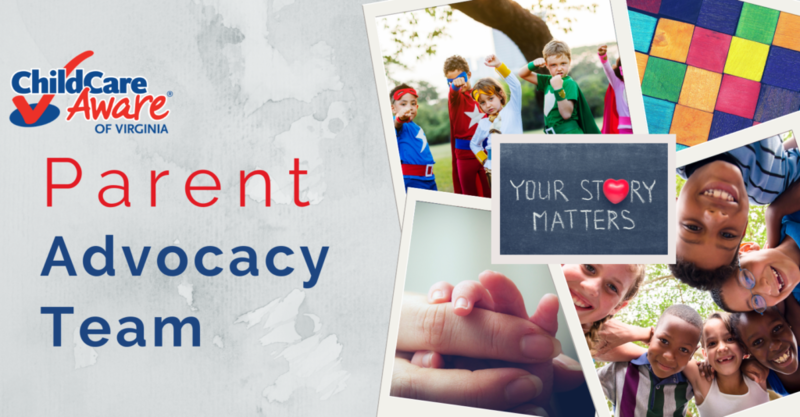 Join our Parent Advocacy Team Facebook page.